Microsoft’s decision to remove the Start menu and replace the same with Start screen in Windows 8 didn’t go well with end users as most XP, Vista, and Windows 7 users who upgraded to Windows 8 either installed third-party Start menu programs, disabled the Start screen or used programs to skip the Start screen to boot directly to desktop. To help desktop users see the desktop environment without having to click the desktop tile on the Start screen upon signing-in, Microsoft has introduced an option to boot directly to desktop in Windows 8.1. The option is useful for millions of desktop and laptop users who use desktop programs to get things done and spend most of their time in desktop environment. So more often than not, they would like to see the desktop as soon as they sign-in to their PCs. It’s not that third-party software developed for Windows 8 weren’t good enough to skip the Start screen but it’s always good have a native option than using a third-party program. 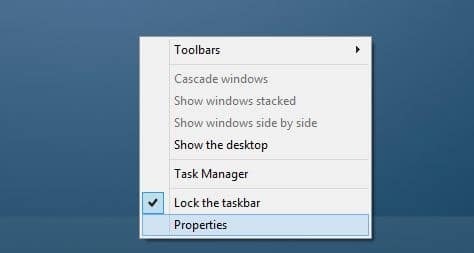 Step 1: Right-click on the empty space of Taskbar and then click Properties to open Taskbar and Navigation Properties. Step 2: Switch to the Navigation tab. 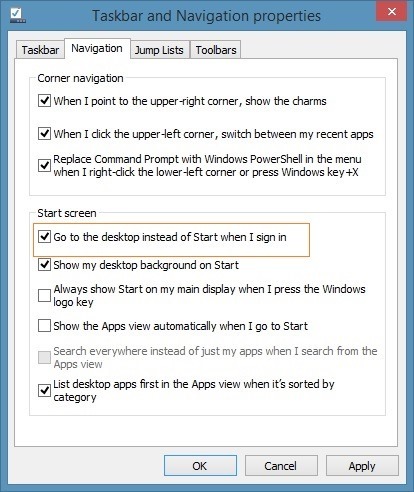 Step 3: Here, check the option titled Go to the desktop instead of Start when I sign in. Click Apply button. That’s it! From next time onwards, whenever you sign-in, you’ll see the desktop instead of Start screen. 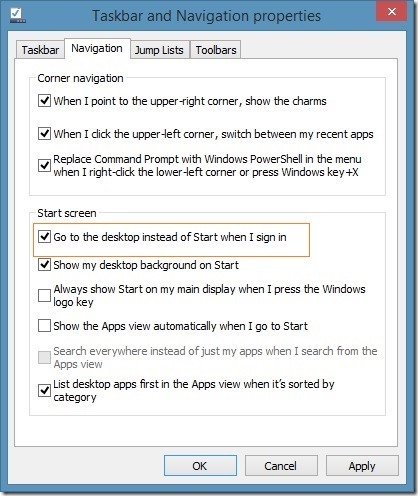 Meanwhile, if you have installed a Start menu in Windows 8.1 and prefer not to have the Start screen, follow our how to disable the Start screen in Windows 8 guide to completely disable Start screen. Why don’t I have a navigation tab on the task bar property menu?